Feb. 13, 2018 — Twice a week last spring, Hannah Lundberg ’18 ventured well out of her comfort zone by volunteering at a hospice in Botswana while spending the semester studying abroad. An English major with a Global Development Studies concentration, Lundberg spent the spring 2017 semester studying abroad in Gaborone, Botswana, where she learned about Southern African history, development, Setswana language, and Tswana culture. While attending Grinnell, Lundberg had read a lot of theoretical materials about improving the quality of life in developing countries. 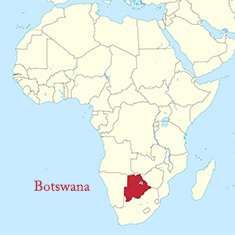 While Botswana is a relatively successful middle-income country, the hospice didn’t have a lot of money for its operations, and the patients typically didn’t have many resources. “It was interesting seeing how this Western model of formalized hospice care was being implemented in a very different cultural and social context,” Lundberg says. A California native, Lundberg looked into several liberal arts colleges, but she didn’t originally have Grinnell College on her radar. However, upon visiting she was drawn to the Global Development Studies concentration, and the College’s ethos of social justice. Lundberg hadn’t traveled overseas before so the thought of studying abroad was initially intimidating. Gradually she warmed up to the idea. Hannah Lundberg '18 in Botswana. A hippo is just peeking out of the water in the background. Lundberg took classes at the University of Botswana. Two classes were taught by a faculty advisor from Kenyon College. Three local women taught another course about the Setswana language. She took one course, Contemporary African Philosophy, with University of Botswana students. It wasn’t a widely attended class, but it still was noteworthy to experience what local students were going through in their academic experience. While working with the chaplain and doing a multitude of tasks at the hospice, Lundberg said it was interesting to hear Botswana resident impressions of the U.S. and how they thought Americans perceived them. “People were well-informed about American politics and popular culture, but they expected us to have a very limited understanding of Botswana, which probably says something about Americans’ poor global perspective,” she says. Lundberg said she grew up in a lot of ways from studying abroad. While she could have taken an easier route by studying somewhere with recognizable surroundings like London, she was forced to navigate a new place with an unfamiliar language. There were a few uncomfortable situations where Lundberg’s limited Setswana knowledge made socializing difficult, but the generosity of her local friends was helpful in those times. Lundberg is applying for masters of divinity programs. She would like to be a pastor or college chaplain. Her Grinnell and Botswana experiences — made possible in part by donors — has her more prepared for life after graduation in May. Most of Lundberg’s friends at public schools did not have similar study abroad opportunities. Learn more about how global learning shapes the Grinnell experience. Support global experiences for students, like Hannah, by making a gift today!